I wish I could wear running shoes, but I shouldn't. When I was a teenager, I tore all of the ligaments in my right ankle. Six weeks of physiotherapy and now, close to 20 years later, I'm still walking around on wobbly scar tissue. My ankle loves to roll out from under me, for any excuse at all. So, for extra support while I'm out strutting around, I wear combat boots. They tend to last longer than comparably priced hiking books and, depending on the boot, can be gussied up for special occasions. The downside to wearing combat boots is that even the lightest among them can still be pretty heavy. Enter GORUCK's MACV-1. 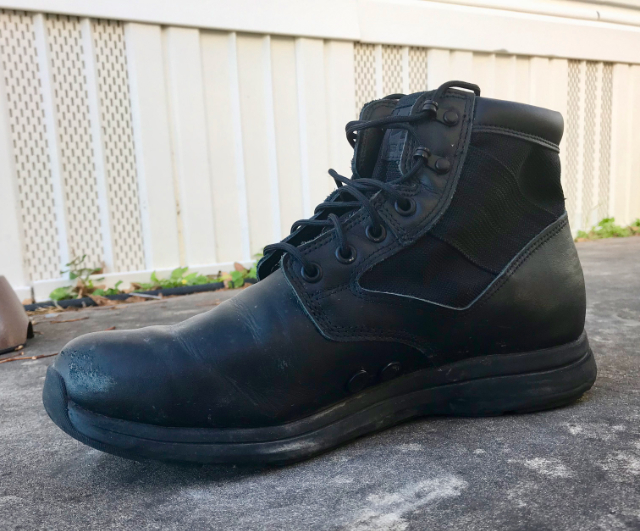 They call it a "Jungle Rucking Boot," but it's not at all dissimilar to the lightweight duty boots from companies like Magnum or 511 Tactical that I used to wear to work. Available in black or coyote brown, they ride just above the ankle and, at 14 ounces each, are one of the lightest pairs of boots I've ever lashed to my footies. Despite their light weight, they seem, so far, to be well made. The majority of the boot is made using full grain leather, which comes out of the box already holding a shine. It didn't take me long to wear the shine down to nothing, but it's the thought that counts.